The two biggest football racism scandals in recent years have been, and will be, tried in very different ways. First, there is the FA judicial process endured by Suarez. He was found guilty and banned for eight matches, a punishment which is almost certain to be challenged as to its legality by Liverpool FC. To get to the bottom of this legality, and the contrast to the Terry case, it is important to understand how guilt versus innocence is judged in the British system. There are two main processes. In the civil courts they refer to "the balance of probabilities". The winner of a civil case is the one who convinces the judge that their story is more than 50% likely to be true. In a criminal case, such as John Terry's, the crime must be proven "beyond reasonable doubt", or close to 100% certain, before the defendant can be found guilty. The FA have obviously gone down the civil law route with Suarez in coming to their judgement. Immediately you can see the unfairness in relation to how the Terry matter has been dealt with. 50.1% certainty to 99% certainty is a very big step indeed. In any case, let's go down the civil route with Suarez and explore where the "balance of probabilities" lie. The alleged offence took place in a crowded goalmouth as a corner was being taken. It is reasonable to expect, therefore, that a conversation between the two players would have been overheard by at least one other person. All of the evidence we have heard suggests that it was not. Therefore, surely, the "balance of probabilities" is in favour of Luis Suarez. Had the CPS looked at the Suarez case in the same manner that they have looked at Terry's, there is no way that they would have proceeded with a prosecution. There is not enough evidence for the case to have been proven beyond reasonable doubt. As it stands, Suarez must fight through a civil judicial process which appears to make up its punishments as it goes along. In terms of the next steps, Liverpool must lodge an appeal with the FA within 14 days. That appeal will be heard and, from the FA's perspective, the case will then be closed. However, there is a body that can overrule the FA's decision - the Court of Arbitration for Sport. The CAS may find this case hard to overrule, given its subjectivity. The CAS tend to look into whether the correct legal steps were taken and whether all processes and procedures are legally watertight. For example, in the recent case of Wen Tong, a Judo star who was stripped of a gold medal for doping, the CAS ruled in her favour because the anti-doping agency had violated certain articles of the Judo federation's rules and regulations during her initial prosecution. In the case of Suarez, there is no evidential breach of procedure by the FA. What is being contested is a subjective judgement. Whether the CAS would get involved in such a case is questionable. Meanwhile, the Terry case will be judged on whether it is beyond reasonable doubt that he abused Ferdinand racially. This is much harder to prove than his guilt on the balance of probabilities would be. So what happens next? Terry will appear in a Magistrates court to try to clear his name. If he succeeds, the FA is likely to side with the official judicial process. If he fails, he will get a £2,500 fine and the FA will have a political green light to hand him a similar punishment to that given to Suarez. The key point of difference is that Suarez hasn't been given this opportunity to clear his name in a court of law. The FA have played judge and jury and he will find the system incredibly difficult to break down. Put simply, the way both cases have been handled is completely unfair. If any club know how to win a court battle, it is Liverpool FC. The club will stand shoulder to shoulder with Suarez and do absolutely everything to help him clear his name. Graft, Craft and How to Fill "The Lucas Role"
Getting the right mix of grafters and crafters is vital to a team's success. A grafter is the type of player who makes up for any failings in natural technical ability through sheer blood, guts and endeavour. Think Dirk Kuyt. On the opposite end of the scale you have crafters, players who have a very high level of technical ability but are are more tactile in their play. Jordan Henderson fits into this box. Liverpool's squad has many players who immediately strike you as being on one end of the scale or the other. In the graft box I would place Lucas, Kuyt, Carroll, Carragher, Flanagan, Kelly, Bellamy, Spearing and Skrtel. In the craft box I would place Maxi, Adam, Henderson, Enrique, Auerlio, Johnson, Coates, Downing and Shelvey. Then you have the players who you can't really put in either box, since they excel in both areas: Suarez, Gerrard and Agger. 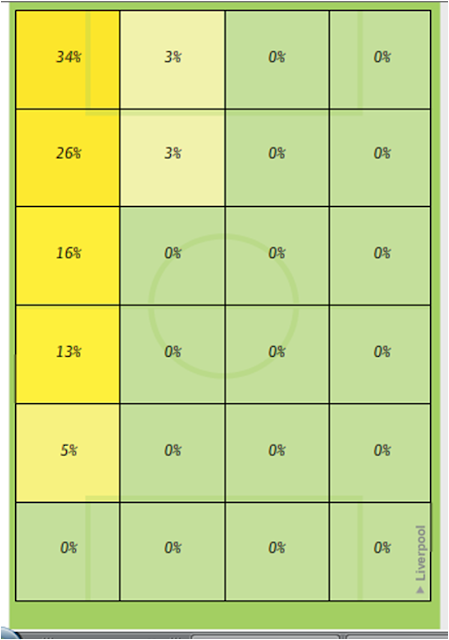 The higher up on the chart a player sits, the better (subjectively!) he is. The further to the left or right he sits, the more of a grafter or a crafter he is. Kuyt is on the far left, Henderson on the far right. At various positions along the top are the four truly world class players we have, the spine of our team. Lucas is the only world class player we have who is on one extremity of the scale, and the very nature of his position demands this. Like Mascherano, Gatusso and Makelele, Lucas is a world class grafter. With this in mind, when looking for a direct replacement for Lucas you surely have to pick from the 'graft' box. This immediately discounts Shelvey, Adam and Henderson since the qualities these players possess are not applicable to the demands of the role. 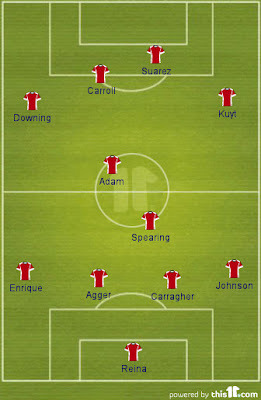 The second solution is to maintain the 4-4-2 / 4-2-3-1 formation and put in a direct replacement for Lucas. For this you need a player with high energy, good tackling ability and a cool head. Step forward Jay Spearing. He has all of these qualities in his game. The question is whether he can perform at a high enough level to be able to compensate for Lucas's loss. Whichever way Kenny goes, the great thing is that he has options. There is a plan B if plan A fails. Plan A for me is for Spearing to come in and make the role his own. In that scenario, at least some good will have come from Lucas's poor fortune. Here is the exclusive English version of Lucas Leiva's recent interview with LFC Brasil. Going straight to the questions, how was it for you when you knew Liverpool were interested in signing you? What were your expectations? A: I found out about Liverpool’s interest in me in March 2007 when I was playing in the Libertadores Cup [like a Champions League of South America]. Rafael Benitez contacted my business manager and my father saying that he was interested in signing me. I was happy because my expectation was to go to a big club in Europe. 2) Much is said about how difficult it is for Brazilians to adapt to life in England, and it is well known that you had a difficult start both on and off the pitch. Did it help having Fabio Aurelio around? A: It is always very difficult to switch countries, especially at such a young age (20 years). England is a country completely different from Brazil, from the language to the climate and the style of football. I had a very difficult start here in Liverpool, but I set my mind to the task of changing my style of play in order to succeed. Fabio helped me on my arrival, particularly within the club, but you end up with many things to learn by yourself. I had the awareness to change my style of football to improve and it paid off. 3) You were on the receiving end of a lot of criticism from fans, especially in your first season. How did this affect you? A: As I said earlier, I had a very tough start in the club where I ended up getting a lot of criticism. I felt that there was a lot of mistrust, but I tried to stay focused so that I could become an important player for Liverpool. Gradually, through hard work and dedication, I’m getting there. 4) Throughout your difficult early career at Liverpool, Rafa Benitez always believed in you and your football. How was your relationship with him? A: Rafa Benitez was very important for me because he always recognised my work. He saw that I had always been devoted to improving as a player, so he was confident even when I received a lot of criticism. I do not know if any other coach would have the patience he had with me. I will always be grateful. 5) The same fans who were so fierce in their criticism of you now worship you, even rating you as the most important player in the Liverpool team. How did it feel to be voted Player of the Season by our fans? A: The award I received last year just shows how much I have improved as a player and the fans recognised that. Fans are fuelled with passion. When you win you are a hero, when you lose they call for your head. I tried to understand this and tried to improve, to reach a level high enough to receive their acceptance. Thank God it happened. It has been a huge accomplishment for me. 6) We are all fans of your personality and how you have progressed in your career so far at Liverpool. In the game against Glasgow Rangers you captained the team from the beginning of the match. Do you dream of being the Liverpool captain one day? A: I had been appointed captain in a Europe League game when Hodgson was in charge but the game against Rangers was remarkable for me, and Kenny Dalglish has always given me great confidence since the beginning of his work here. Being captain of Liverpool is a great responsibility. I hope to have other opportunities, it gives me huge pride. 7) Liverpool had a hard time last season on and off the field until the new owners took over. How did it impact the team? A: The new owners are doing everything to give us the resources to win titles. The club have signed many new players. It is normal for a new team to take time to gel, but I see our team much stronger than last year, despite acknowledging that the results have not been as good as we would like. 8) Do you think your role on the team has evolved with the arrival of Kenny Dalglish? How is having King Kenny as coach? A: Kenny Dalglish is considered the greatest player in the history of Liverpool. He won all possible titles as a player and as coach has been very successful. Kenny always gives me confidence. I've grown a lot since his arrival. He was a player so he understands what it means to be a part of a team. This helps in his relationship with the group. 9) Lucas, you were formed at Grêmio’s Academy, and the classic Gre-Nal (Grêmio vs Internacional) is considered as the greatest rivalry in Brazil, do you feel the same pressure in the Merseyside Derby? A: My days with long hair are gone. I enjoyed that period a lot. I liked my long hair, but it is gone. My life is in a different place now. Honestly, I do not see myself ever having long hair again. One more time thank you for your participation here. Not only the Liverpool fans, but all Brazilians are rooting for you to be a big success for both the club and the national team. And for sure, with the way you're going, you already have our vote for the best Liverpool player this season. Thank you, Lucas! "Son cosas que pasan en el fútbol, cosas del momento, que a uno lo dejan mal. Ahora hay que esperar que se decida el tema y luego, tanto el jugador del Manchester como yo, vamos a tener que dejar las cosas claras. Y según para el lado que salga el fallo tendremos que pedir perdón. La Federación inglesa lo va a tener que aclarar con él, porque no hay pruebas de que yo le haya dicho algo racista. Y no se lo dije. Hubo dos partes de la discusión, una en español y otra en inglés. No lo insulté, solo fue una forma de expresarme. Lo llamé de una forma que sus propios compañeros del Manchester le dicen. Es más, ellos mismos se sorprendieron." "There are things that happen in football, things in [the heat of] the moment, that leaves someone feeling bad. Now we've got to wait to see this issue judged and then, as much for the Manchester player as me, we'll have to clear things up. And depending on where the judgement lies, one of us will have to say sorry. The English federation will have to clear it up with him, because there is no proof that I said anything racist. I didn't say it. There were two parts to the argument. One in Spanish and one in English. I didn't insult him, it was just my way of expressing myself. I called him something that his own team-mates at Manchester say to him. Moreover, [even] they were surprised". The first column shows how many minutes there are between each shot on goal. Manchester City have the most prolific attack, averaging a shot every 6 minutes. They are the only team in the league who shoot at goal more often than Liverpool. There is, therefore, nothing wrong with Liverpool's ability to create chances. The second column shows how often each team hits the target. Manchester United are the most accurate in this area, hitting the target more times than they miss. Liverpool are the least accurate by a comfortable distance. The third column shows how many shots are converted into goals. It is this stat more than any other which demonstrates our biggest weakness. The top two teams in the league convert 22% of their shots into goals, whilst Liverpool manage just 9%. To put this into context, if Liverpool would have matched this 22% chance conversion, we would have scored a remarkable 33 goals so far this season. This equates to an extra 1.7 goals per game. The points those goals would have generated would have meant that, instead of fighting for fourth place, we would be in a title race. 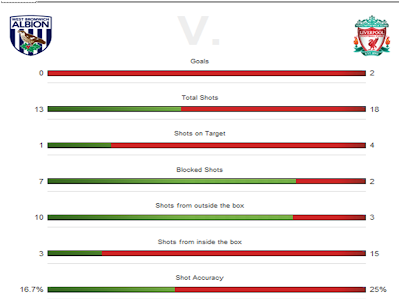 Suarez and Carroll are clearly the main contributors to both our goals tally and our low shot conversion ratio. There have been calls for Craig Bellamy to be given an opportunity in attack, and the above stats would appear to endorse this view. Bellamy has been generally used as a substitute so far this season, and has been coming off the bench to play in wide positions. Taking this into account, the fact that he manages to have a shot on goal almost as often as Carroll is impressive. He also has the highest shot conversion ratio in the team. Many would argue that, given how poor we have been in this department, Bellamy would be unlikely to do any worse. 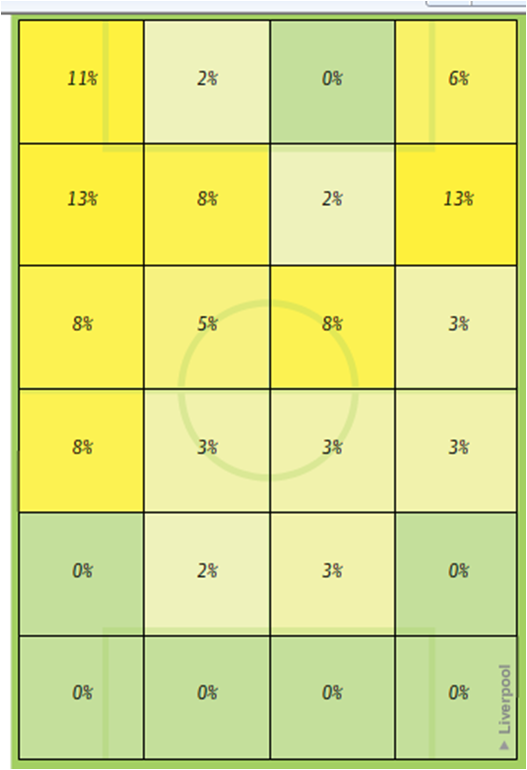 To put the player stats into context, Van Persie has a 30% conversion, Van Der Vaart has 25% and Torres has 15%. All higher than our front two. Hitting the woodwork 10 times obviously does not help, but we have to start converting chances. Put simply, our poor chance conversion will cost us a place in the Champions League if it does not improve considerably. I will update these stats later in the season. There has been an ongoing debate for some time now about the impact Jamie Carragher's lack of pace has on the Liverpool defensive line. There is a theory that Carragher holds the line deep to prevent younger, quicker attackers stealing a march on him on the break. Carragher's calf injury has inadvertently helped us find out whether this is true. 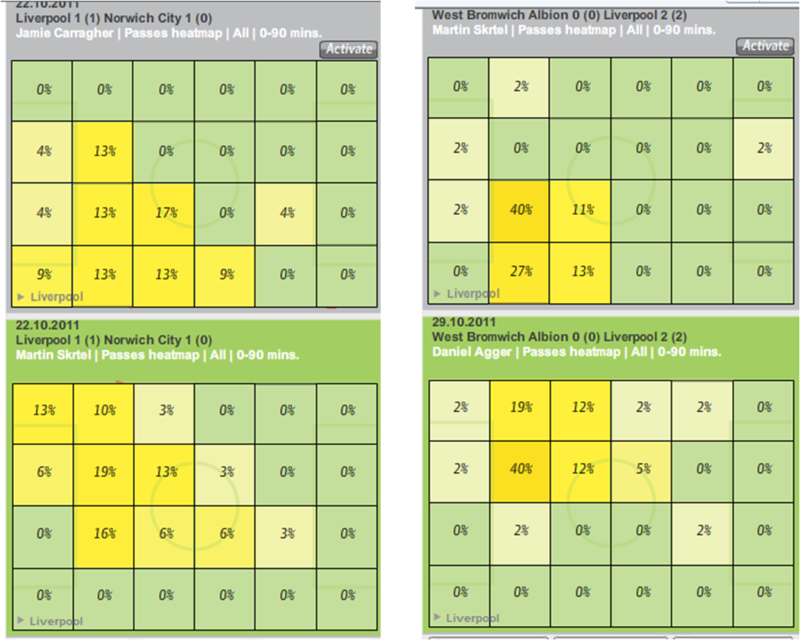 By looking at the Liverpool defensive line with Carragher (against Norwich) and without him (against West Brom) we can test whether the theory has any basis in reality. 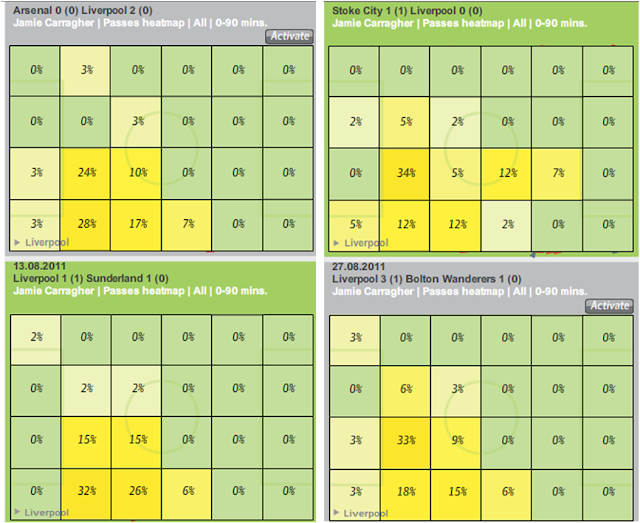 On the left hand side of the screen are the Norwich ﻿heat maps for Carragher (top image) and Skrtel (bottom image). 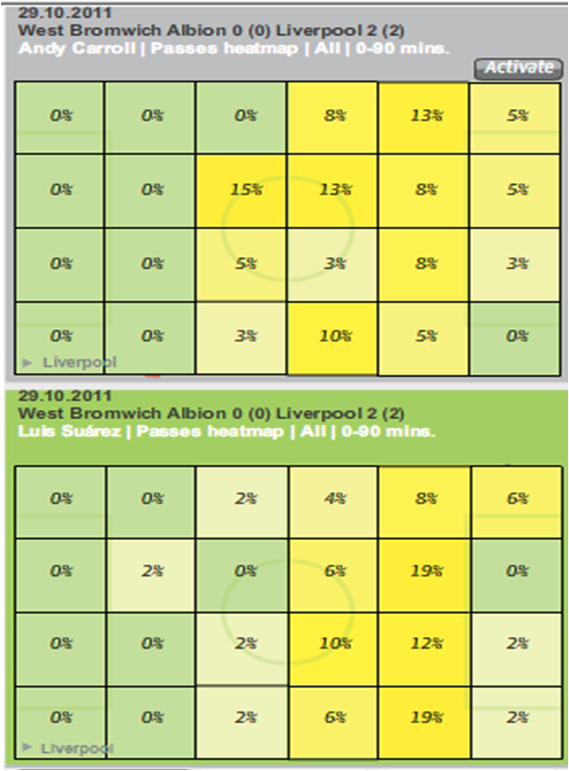 On the right hand side of the screen are the West Brom heat maps for Skrtel (top image) and Agger (bottom image). The key stats to pull out of the two tables above are "Shots on Target" and "Shots inside the box". 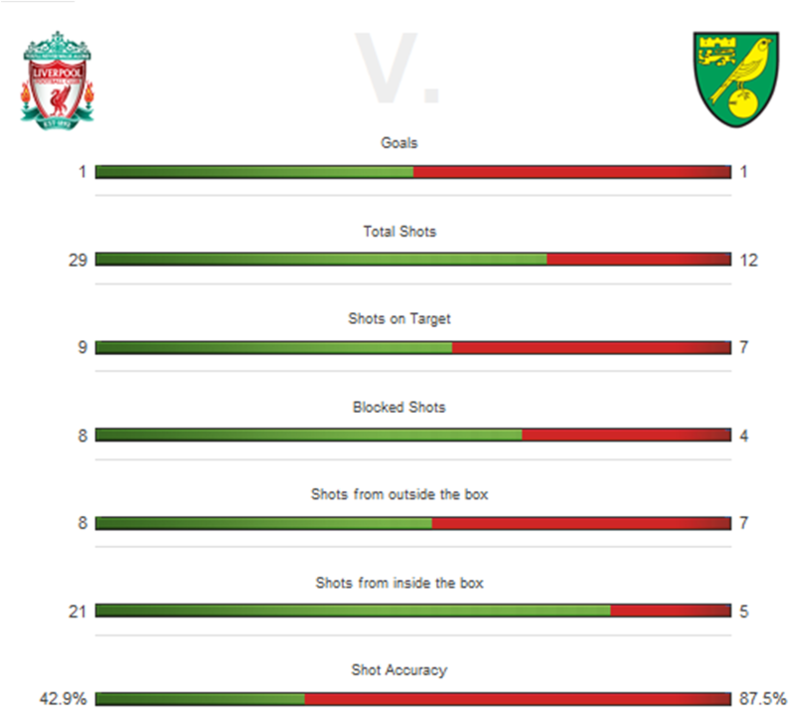 Lying deep against Norwich enabled them to encroach into our penalty area more, and they managed 7 shots on target. Against West Brom, we restricted them to shooting from distance and they only managed one shot on target. With 28 unsuccessful shots, we can bemoan a lack of composure in front of goal against Norwich. 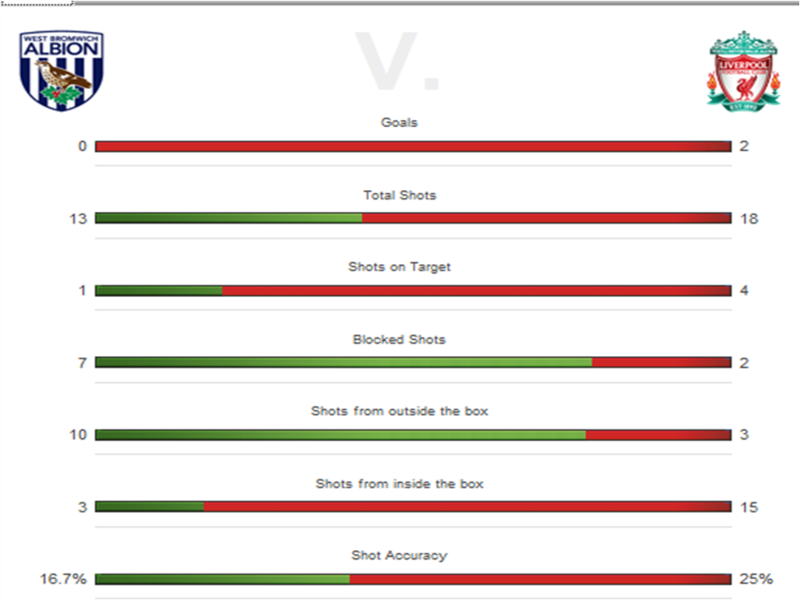 However, it was the 5 shots we allowed them to have in our penalty area that cost us two points. 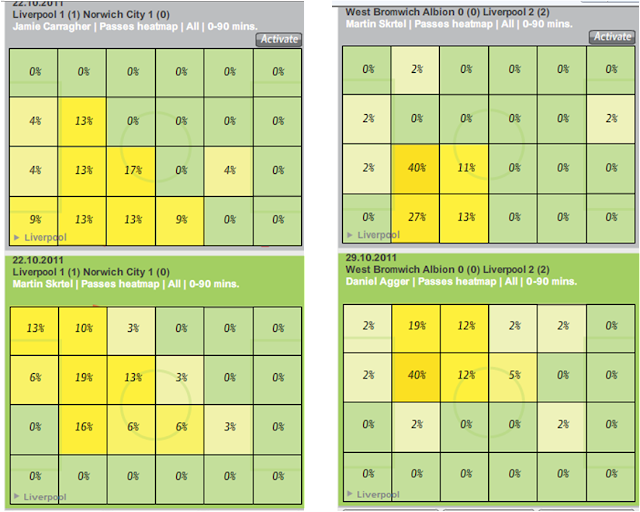 In all four games, Carragher is playing higher up the pitch than he did against Norwich. He obviously feels more confident getting forward when accompanied by the pacey Agger. However, in all but the game against Sunderland, Carragher's defensive line was deeper than that held by Agger and Skrtel against West Brom. We do, therefore, play deeper with Carragher in defence. The theory holds true. 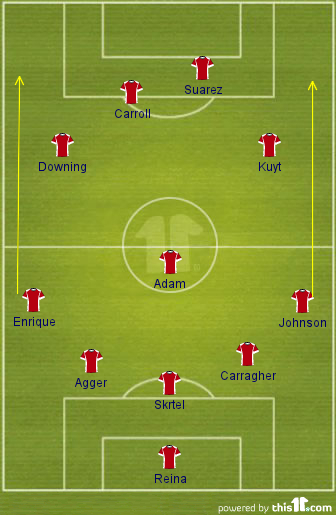 Agger and Carragher are well suited partners in central defence, whilst Skrtel and Carragher are less so. Liverpool have been very strong at the back in the first 10 games of the season. Only Newcastle and Manchester City have conceded less, so we must be doing something right. However, with Carragher turning 34 in January, he is not going to get any faster. 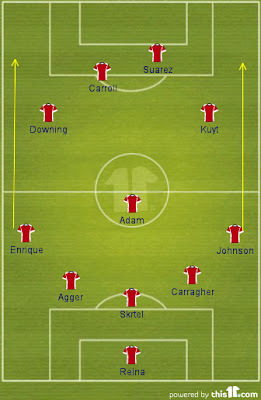 The Liverpool defensive line whilst Carragher is in the team is definitely something to keep an eye on. It may surprise some people to hear that prior to the West Brom game, with just one exception, Andy Carroll has been on the pitch every time Luis Suarez has scored this season. Another remarkable stat is that they have only started 10 games together in 10 months. Their time together on the pitch has therefore been both fruitful and brief. A lot of people have a misunderstanding about Carroll’s role for Liverpool. Many assume that he plays further forward than Suarez, like a classic No.9, waiting in the box for a cross to put his head on. In reality, however, Carroll is more deep-lying. This role is well suited to Carroll’s attributes: tall, powerful and awkward. Put simply, he is a nuisance to the opposition defenders. When Carroll takes up this deep position he forces defenders to make decisions, dragging them out of their comfort zone and creating the space for Suarez and the supporting midfielders to exploit. 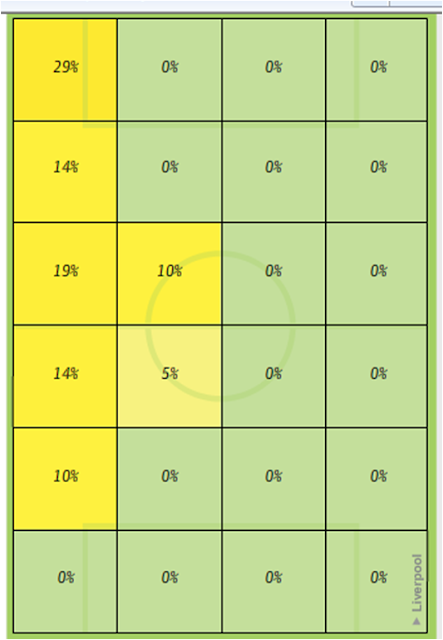 There is no doubt that McAuley’s poor positional play left a lot of space for the strikers to exploit. However, given the recent criticism about Liverpool’s ability to convert chances, it was a huge relief to see such clinical execution. 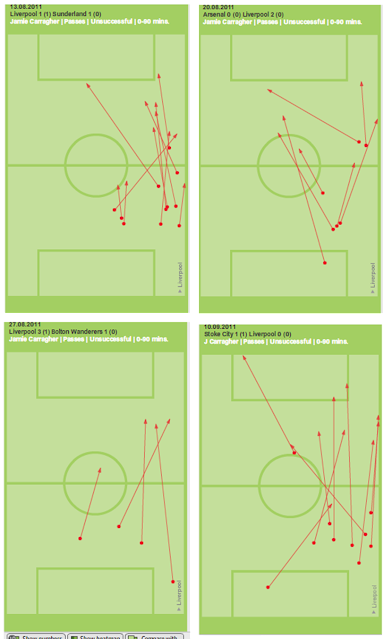 Carroll and Suarez were responsible for 11 out of Liverpool’s 16 shots during the game. Against Norwich, with Carroll on the bench, Suarez had by far most shots in the team. 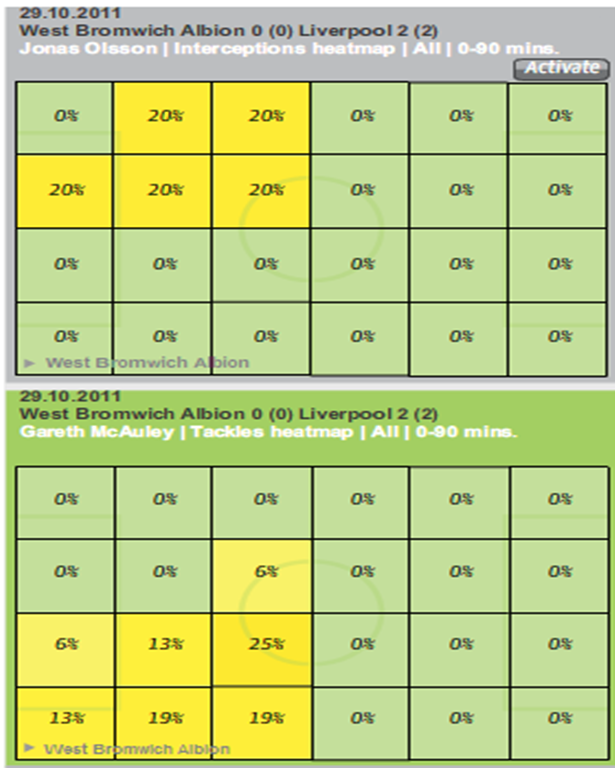 Against West Brom, Carroll had 7 shots on goal, almost double Suarez’s total. This clearly shows a sharing of the striking responsibility, in contrast to the game against Norwich where Suarez was a lone ranger. Carroll’s 7 shots are even more impressive when you revisit the stat from earlier: he spent two thirds of the game outside of the danger zone, making a nuisance of himself. 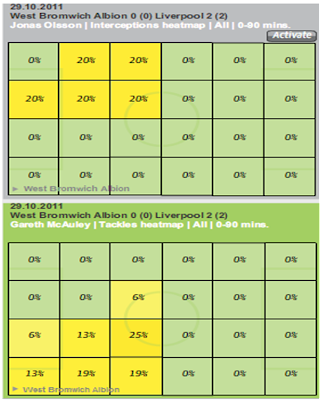 West Brom never really got started as an attacking threat during the game. Again, Suarez and Carroll can take a great deal of credit for this. They are both excellent at defending from the front, harrying defenders and stopping moves before they start. Of the 86 possession duels contested on the pitch, Liverpool’s two attackers were involved in 35 of them (Suarez 12 Carroll 23). To put these numbers into context, Lucas was only involved in 10 possession duels in the entire game. As ever, Carroll was a menace in the air, competing in 18 out of Liverpool’s 29 Aerial Duals. All in all, Carroll's contribution against West Brom was fantastic and he got the goal his display deserved. The stats from the West Brom game point to a partnership developing between Liverpool's two strikers which promises to blossom into the deadliest in the league. 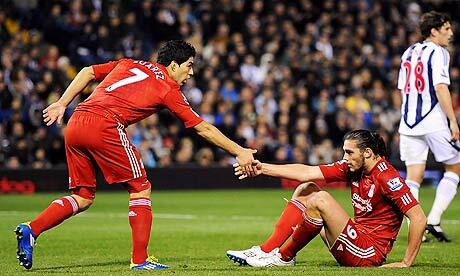 Suarez and Carroll have complimentary styles which, on paper, have always looked compatible. One thing they have not had, as of yet, is a run of games together. The performance against West Brom strongly suggests that they are going to be seeing a lot more of each other as the season progresses. Stewart Downing came to Liverpool with many fans feeling that we had settled for second best after United had signed Ashley Young. Some even intimated that, in replacing Downing with N’Zogbia, Villa had improved their first team for a fraction of the price. Dalglish has always insisted that Downing was his first choice, and a look at his first six games for Liverpool helps to show why this was the case. He played many penetrating balls into the danger area in the first half and linked up well with Enrique down the left hand side. A turning point for his performance was when he switched to the right for one move in the first half, cutting inside in the 33rd minute and sending a thundering drive onto the crossbar. Had this move led to the debut goal his effort deserved, Liverpool would have gone in at half time 2-0 up, well on the way to a comfortable win. Against Arsenal, this experiment of switching Downing to the right continued. It was an extremely positive performance by him, with 55% of his possession taking place in Arsenal’s final third. His heat map shows that he spent almost as much time on the right hand side as he did on the left. The partnership between Downing and Enrique has been one of the highlights of the season so far. Both players are naturally left footed, very attack minded and they both possess the ability to pass and move quickly and accurately. Much of our good work so far this season has come from their link up play. His partnership with Martin Skrtel did not bear fruit. Skrtel does not have Enrique’s ability to drive into the final third on the overlap, and Downing does not have the ability with his right foot to get penetrating crosses into the box. 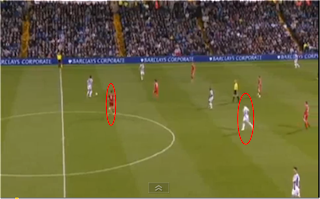 This led to a situation where the interplay between Skrtel and Downing was completely ineffective. It personified the performance: Liverpool dominated possession but could not find a way through the Stoke defence. The Tottenham game again exposed Downing’s ineffectiveness on the right, although he is in no way to blame for the 4-0 defeat. Looking at the above chalkboard in more detail, it is also clear that Suarez and Carroll were benefiting from Downing’s dominance down the left, with each of them collecting the ball from him on the edge of the six yard box twice. 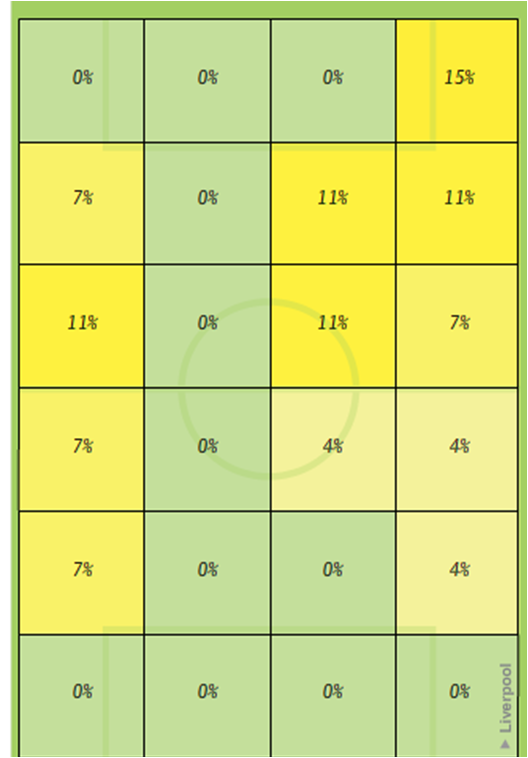 Given the finishing ability of both strikers, if Downing is able to provide an average of four balls into this area each game we are in for some very high score lines. Overall, Downing’s start to the season has been very consistent. The highlight has been the partnership with Enrique whilst the low light has been the largely unsuccessful experiment down the right. He has been a great asset to the team and is an early contender to be runner-up to Suarez for player of the season. At the age of 33, time is against Jamie Carragher. This season more than ever, his status as a first choice starter is under intense scrutiny. Big questions are starting to be asked openly by Liverpool fans about whether Carragher still warrants a place in Liverpool’s First XI. So, why are the murmurings of discontent growing louder by the week? One part of his game that is heavily under the microscope is his passing. Indeed, season on season, Carragher’s pass success rate for Liverpool is dropping at an alarming rate. In 2008/9 it was 84.1%, in 2009/10 it dropped to 76.5% and last season it fell again to 72.4%. These stats show clearly why the criticism of his passing game has intensified in recent years. Carragher’s overall pass success rate this season is 80%, about average for the Liverpool team, but his long ball statistics tell a different story. 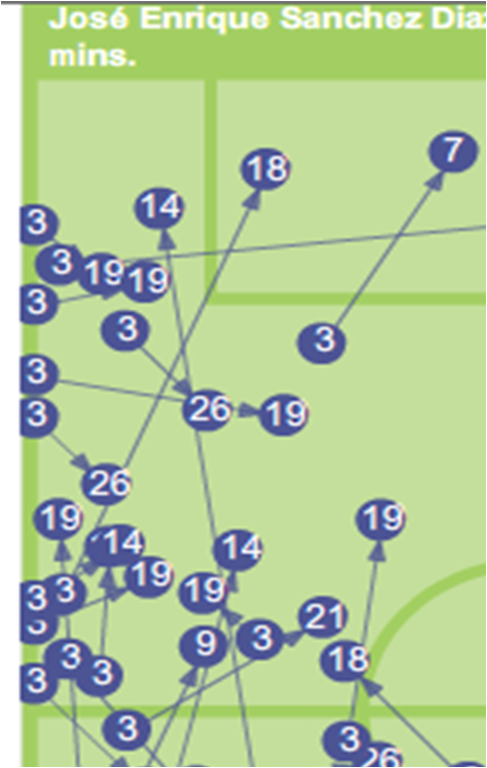 Carragher has been responsible for 41 of Liverpool’s 180 long passes this season. Of these, only 17 have found their intended target, a 41% success rate. 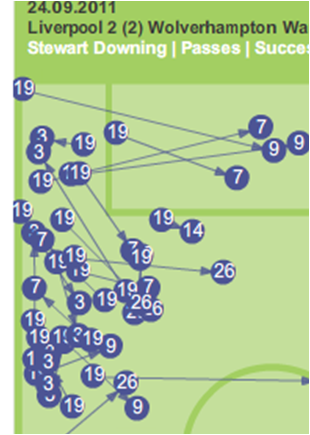 To put this into context, Daniel Agger has only attempted 15 long passes, with an impressive 66% success rate. The only Liverpool player who has played more long passes than Carragher is Jose Reina, who has a 53% success rate from his 54 long passes. Passing is therefore a weakness in Carragher’s game, and in chronic decline. Carragher has always been slow, but with age he has slowed even more. Liverpool’s line is getting deeper and deeper to make up for this lack of pace and this invites the opposition forward. For most of this season, our attacking play has disguised this issue. However, against teams like Manchester United and Manchester City we risk being left seriously exposed. There have been two key warning signs already this season. Against Bolton, Carragher’s howler in the penalty area resulted in their consolation goal. At the time it was lost within the glory of our 3-1 win. His mistake against Stoke, however, cost us the game. Carragher was unable to respond to Walters’ turn of pace in the penalty area and an arm across the chest was enough to gift Stoke a penalty. 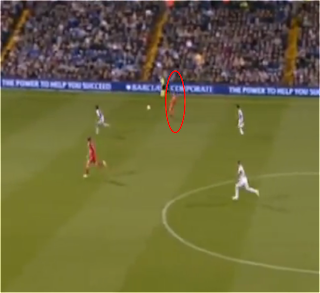 Walters went down very easily, but Carragher’s defensive lapse gifted him the opportunity to do so. 2 of the 3 league goals conceded by Liverpool this season have been caused by a defensive lapse by Carragher. However, his organisational and leadership qualities are amongst the best in the league. 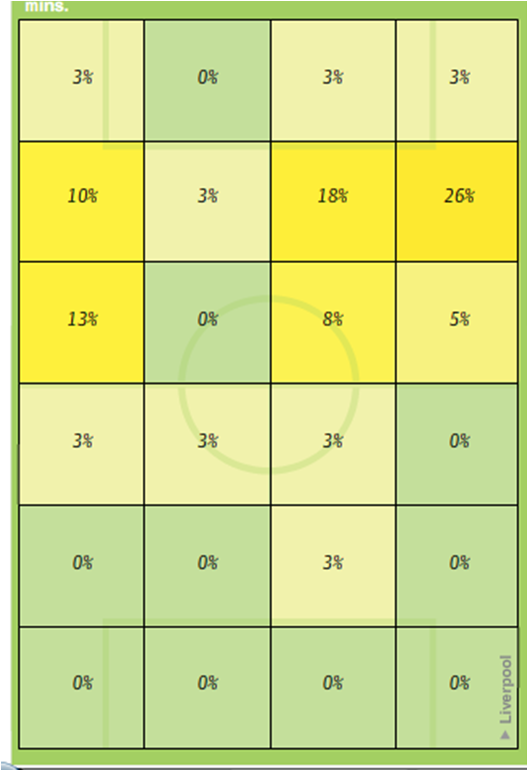 Also in his favour is the fact that Skrtel has his own defensive frailties whilst Coates’ is young and inexperienced. Had we signed Dann, Cahill or Phil Jones in the summer, Carragher’s place in the first team would be in greater jeopardy than it already is. As it stands, he is holding on to a starting place by the skin of his teeth. The recent purchase of AS Roma by a Boston based investment group did not set the back pages on fire. The deal was reported in the business pages, with the main focus being on Roma becoming the first Italian club to fall into foreign hands. The newsworthy element of the deal for Liverpool FC is that the consortium’s leader, Thomas DiBenedetto, represents 1/13th of Fenway Sports Group. DiBenedetto bought the club using a separate investment company, “DiBenedetto AS Roma LLC”. 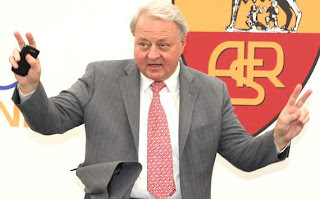 There cannot be a direct link between FSG and Roma due to strict ownership rules preventing groups from controlling more than one club participating in a UEFA competition. It is safe to assume, however, that the new relationship between the boardrooms could hardly be closer. It is both ironic and intriguing that the two football clubs who contested the European Cup Final in 1984 are now so closely tied, especially given the violence of the past three decades. The final in Rome is nostalgically remembered for Bruce Grobbelaar’s antics on the goal line, but many of the fans who were there have far more disturbing memories. Following Liverpool’s win, large gangs of Roma’s “Ultrà Curva Sud” roamed the streets looking for victims to exert their revenge on. The Ultras showed no mercy, targeting families and children. A 13 year old boy was attacked with a machete and required over 200 stitches. Dozens of English fans were stabbed and the police were heavily criticised for offering no protection. It can be argued that the events in Rome acted as a catalyst for what happened at Heysel the following year. The violence did not end there. In early 2001 Liverpool played Roma in a UEFA cup match and 14 fans were stabbed. Later that year the two clubs met in the Champions League and a further 5 Liverpool fans were stabbed. 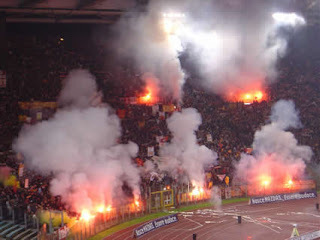 Over the next few years, fans of Real Madrid, Middlesbrough, Man United and Arsenal all visited Rome and experienced the gratuitous violence of the Ultras. The Ultrà Curva Sud are massively influential. During the 2004 derby with Lazio, 3 leaders of the group walked onto the pitch, approached Francesco Totti and threatened to kill him if the game continued. Totti spoke to the referee and the game was abandoned. Soon after, the stadium was set on fire and a huge riot erupted outside. These events do not show up on balance sheets or annual reports, but they are major issues that DiBenedetto will face as he attempts to return the club to its former glory. It will be interesting to see how the business relationship with Liverpool develops, but one thing is for sure: However close the two clubs become at boardroom level, the relationship between the fans is broken beyond repair. Mental toughness is a key attribute for any young player to possess, as Rafael Benitez alluded to when unveiling the 20 year old Lucas Leiva in 2007, “We believe he has the mentality and the character you need to do well in England" said Benitez. Looking at his competition for a starting place, Lucas was going to need it. His first challenge as a Liverpool player was to break into a team blessed with the finest central midfielders in England, Spain and Argentina. His youthful mistakes were benchmarked against the often superlative performances of those around him, and so it was inevitable that the critics would start to hone in on him. In the 7th minute of his first big test, replacing Mascherano in the starting line up against Arsenal, Lucas made a terrible blunder that set Adebayor racing towards goal. Luckily, Liverpool got away with it, but first impressions last. Following his performance in a dire 0-0 draw against Fulham, one journalist wrote, “The scouts who found him need to be seriously quizzed - it must be hard to find a Brazilian footballer with such limited ability”. Things went from bad to worse from here. He gave away a penalty and was sent off against Everton as Liverpool were knocked out of the FA Cup. The following week he gave away another penalty, against Wigan, which cost Liverpool two vital points in the race for the title. At this point in time, most reds would have been happy if he had never pulled on a Liverpool shirt again. On a sunny Saturday lunchtime in March 2009, Lucas started his fight back against the critics. Liverpool were at Old Trafford to play their title rivals in the biggest game of the season. With star midfield playmaker Xabi Alonso injured, Benitez called on Lucas, offering the 22 year old an opportunity to come of age. Lucas rose to the occasion. He partnered Javier Mascherano in a midfield that completely outplayed Carrick and Anderson in the 4-1 win. He doubled up with the full-backs superbly well, rendering Ronaldo ineffective from the wing for the entire game and snuffing out Rooney’s infiltration of the midfield. Lucas was at the centre of everything Liverpool did well. He had an 83% pass completion rate (against a Liverpool average of 75%) with an impressive 54% of these passes in the attacking half of the field. He won 77% of the tackles he went in for and won 54% of his 50-50 midfield duals. On top of this, he made no defensive errors in the entire match. All this against a Manchester United team who, up until this game, had been running away with the title. Interestingly, Lucas received mixed reactions after the game. The Guardian described his performance as “lacklustre” whilst The Telegraph reported that he played “superbly well”. Like many players of his ilk, the subtle brilliance of Lucas can often be missed by the untrained eye. The prediction from Benitez that Lucas would have a ‘big season’ was correct. He started it by playing 6 games consecutively for the first time since joining the club and went on to play in 35 out of the 38 league games. His pass completion rate for the season of 84% was amongst the highest at the club, with a very impressive 72% of his passing inside the opponent’s half of the field. At the end of the season, he was voted “Young Player of the Year” by the fans, an accolade that would have been unthinkable back in 2008. By the 2010/11 season, with the departure of Javier Mascherano, Lucas had made the holding central midfield role his own. He made 33 appearances in the league, a total only bettered by the ever present players Reina and Skrtel. It was the best season Lucas had enjoyed in a Liverpool shirt. He had a pass completion rate for the season of 83%, with 66% of his passes going forwards and just 6% going backwards. In comparison, Liverpool’s total stats for the season show that they had a 77% pass completion rate, with 57% forward passes and 16% backward. Lucas, therefore, was significantly above average in terms of his passing accuracy and his ability to play penetrating passes forward. The improvement Lucas has shown over the past two years has been phenomenal. The critical voices are almost mute, with just a few misguided murmurings from those sections of the crowd with untrained eyes. Benitez was right about his mental toughness, and he has become a certain starter under the new Dalglish era. It is easy to forget that Lucas is still only 24 years old. His best years are ahead of him and the great news for LFC fans is that they will be enjoyed at Anfield.